Father’s Day offers the perfect opportunity to show our appreciation to the men that have played important roles in our lives. But for many of us, coming up with a unique Father’s Day gift can be a struggle. This year, go beyond the traditional gifts of neckties and golf balls and opt to treat your dad or husband to some fine tequila. ner things in life and makes a wonderful choice for those who love high-end scotches, bourbons, and cognac. Crafted from 100% blue agave produced in Los Altos of Jalisco, Mexico, this fine sipping tequila has been aged in barrels for 18 months, giving the consumer an outstanding oaky flavor and fragrances of vanilla, almond, and nutmeg with each sip. And, at IZKALI’s reasonable price, it’s an affordable luxury that dad will love. Don’t show up to dad’s house empty handed on June 17. 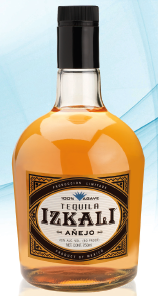 A bottle of IZKALI will make a thoughtful and memorable present for the men of your life.